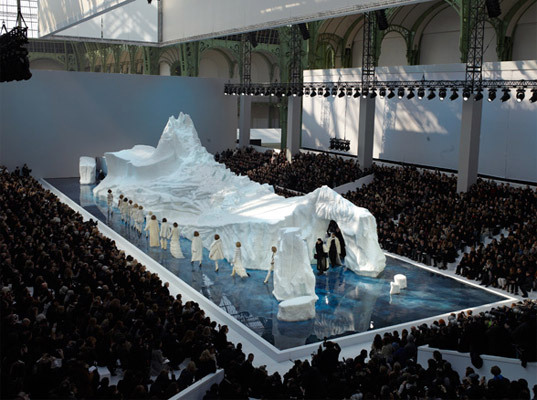 A political statement about climate change was the last thing on Karl Lagerfeld’s mind when he trotted Chanel’s Fall/Winter 2010 collection in front of a giant, 265-ton glacier in Paris on Tuesday. (He counts the Ice Hotel in Sweden, not drowning polar bears, as his inspiration.) But can an iceberg be just an iceberg in these post-COP15 times? “Have you felt any warming this winter?” Lagerfeld asked reporters after the show. “Maybe that’s all nonsense, who knows.” Et tu, Karl? It took 35 ice sculptors, flown in from around the world, six days to carve the 28-foot-tall northern Swedish import into a tableau of floating ice caps on a glittering Arctic sea—in reality, a 5,300-square-meter box garnished with a thin layer of water. It took 35 ice sculptors six days to carve the 28-foot-tall, 265-ton glacier from northern Sweden. The Grand Palais itself was kept at subzero temperatures, all the more, perhaps, to make the litany of tweedy knits, shaggy fur trim (all faux), and knee-high yeti boots even more inviting. agreed....nice idea...it looks reeeeallly cool. But EXTREMELY wasteful. What the hell? I forwarding this on to Greenpeace immediately. Put Lagerfeld in JAIL.